Helping solve the kidney shortage was something that, Amy Waterman, Ph.D., an Associate Professor and national transplant educator, dreamed of doing when she was growing up in Knoxville, TN. But to do that, she needed to surround herself from as many smart and diverse people as she could. When she moved to Los Angeles in 2013 to work at UCLA, a friend told her that her favorite week of the year was when she attended the TED Conference in Vancouver, BC, in part because of all the creative and intelligent people that were gathered in one place. “She told me that people who attended TED had a higher level of hope about the future and ability to make things happen,” Amy says. “And, then, she told me to apply.” A TED application consists of essays explaining leadership skills, the place of service in the applicant’s life, and recommendations from three peers. “It was kind of like applying for college,” says Amy, laughing. It took 3 months before the TED Committee gave her an answer. 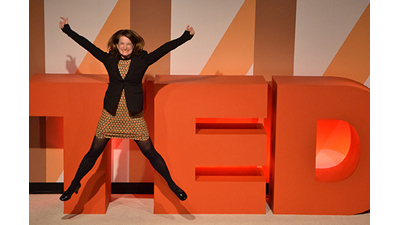 You can see how she felt when she got her acceptance to TED2016: Dream by taking another look at the photo above. Amy has spent the weeks leading up to TED getting acquainted with other attendees through a private Facebook group, meeting some locals who are going, and reading the books that TED sends attendees in advance. She already learned from the Facebook postings that another TED attendee is considering donating a kidney to her cousin. “I have packed Explore Transplant and Explore Living Donation education to share in my suitcase,” she says.